The NASA's New Horizons Spacecraft took this stunning image of Pluto only a few minutes after the Closest Approach which occurred on July 14, 2015. The image was obtained at a High Phase Angle - that is, with the Sun on the other side of Pluto, as viewed by New Horizons. As seen here, the Sunlight filters through, and then illuminates Pluto's complex Atmospheric Haze Layers. The Southern Portions of the Nitrogen-made Ice Plains - informally named Sputnik Planum -, as well as Mountains visible of the informally named Norgay Montes, can also be seen across Pluto's crescent, at the top of the image. Looking back at Pluto with images like this one, gives to the New Horizons' Scientists a good amount of information about Pluto's Hazes and Surface Properties that they were not able to get from images taken during the approach. This picture was obtained by the New Horizons' Ralph/Multispectral Visual Imaging Camera (or "MVIC", for short) approximately 13.400 miles (such as about 21.565,156 Km) from Pluto, and roughly 19 minutes after New Horizons' Closest Approach. The image has a resolution of about 1400 feet (such as approxs. 426,72 meters) per pixel. The inset located at the top right (Dx) of the frame shows us a detail of Pluto's crescent, including an intriguing bright wisp (near the center) measuring tens of miles across and that may be a discreet, low-lying Cloud in Pluto's Atmosphere; if so, it would be the only one yet identified in New Horizons' imagery. This Cloud - if that's what it really seems to be - is visible for the very same reason which the Haze Layers are so bright: illumination from the Sunlight grazing Pluto's Surface at a Low Angle. 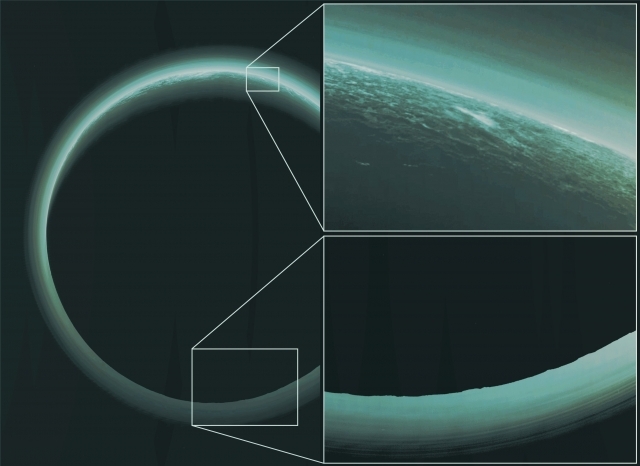 Furthermore, several Atmospheric Models suggest that Methane Clouds can occasionally form in Pluto's Atmosphere. The scene in this first inset is about 140 miles (such as roughly 225,3076 Km) across. The inset visible at the bottom right (Dx) of the image, shows us more details located on the Nicht Side of Pluto. This Terrain can be seen because it is illuminated from behind by illuminated hazes that silhouette the Plutonian Limb. The Topography here appears quite rugged, and broad Valleys as well as sharp Peaks with Relief - totaling about 3 miles (such as approx. 4,82802 Km) - are also apparent. This image, made from a closer range, is much better than the lower-resolution images of this same Terrain that were taken several days before the Closest Approach. These silhouetted Terrains, therefore, act as a useful "anchor point", giving to the New Horizons' Scientists a rare, detailed glimpse at the lay of the land in this mysterious part of Pluto, which is seen at High Resolution only in the twilight. The scene in this second inset is roughly 460 miles (such as about 740,2964 Km) wide. The image (which is an Original NASA - New Horizons Spacecraft's Approx. Natural Colors and NON Map-Projected Image-Mosaic published on the NASA - Planetary Photojournal with the ID n. 20727) has been additionally processed, reduced in size to fit the page, contrast enhanced and sharpened, Gamma corrected and then colorized (according to an educated guess - or an informed speculation, if you wish - carried out by Dr Paolo C. Fienga-LXTT-IPF) in Absolute Natural Colors (such as the colors that a normal human eye would actually perceive if someone were onboard the NASA - New Horizons Spacecraft and then looked outside, towards the Dwarf-Planet Pluto), by using an original technique created - and, in time, dramatically improved - by the Lunar Explorer Italia Team.